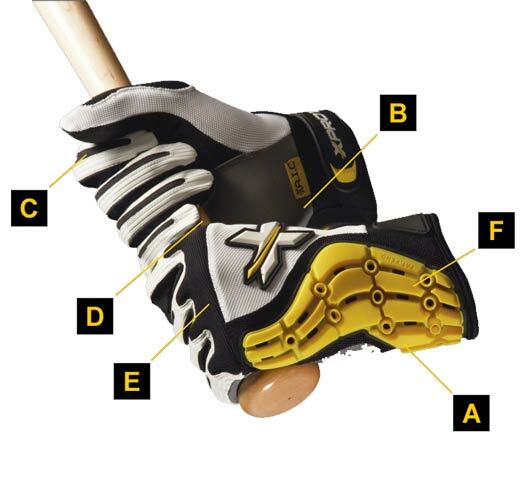 The Xprotex Hammr offers both wrist and hand protection for batters. Designed to help protect the small bones in the hand and in the wrist that are most vulnerable to injury from a pitched ball. Hammr model fits both left and right handed batters. HAMMR's are sold and priced in complete pairs. A.I.C. (Advanced Impact Composite), an impact absorbing intelligent padded material conceived through 30 months of development and testing. In plain language this means the impact load generated by a 100 MPH ball is reduced to that equivalent to being struck with a 40 MPH ball, thus drastically reducing the chance of a career changing injury. B - Pittards ARMORTAN goatskin leather palm. C - Lycra finger slots to increase flexibility and comfort. D - Palm / Bat interface offers optimal grip. E - Neo Protection covers knuckle area. F - A.I.C. Wrist Protection Insert effectively doubles wrist bone protection. One model fits both left and right handed batters. Please download and read sizing instruction CAREFULLY to ensrure you order your correct glove size.